I was searching Twilio integration with salesforce on the web but didn't find any, so am posting this a simple POC of sending SMS to the mobile using Twilio from the Salesforce UI. Its simple but just you need to do something extra two make this functionality working. Twilio will provide you a number, via which it will sent you SMS. Now login to your salesforce account and create a Remote Site Setting. 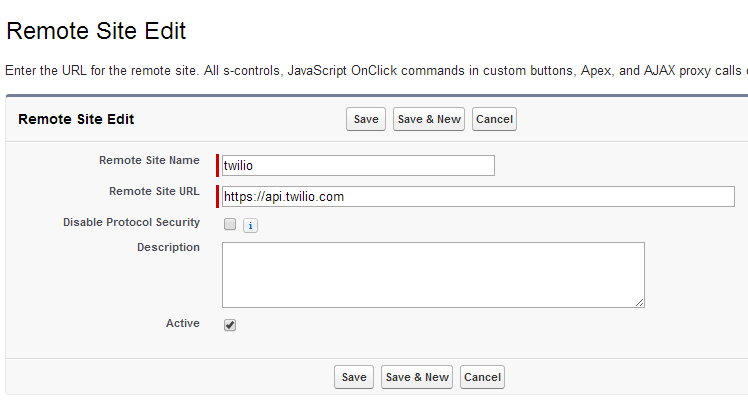 And then create a custom setting named as Twilio Configuration. We are gonna use them in our apex classes. Create fields on the custom setting you've just created, with same API name as below shown. Now we need to provide some values to the fields ofthe custom setting click on Manage button shown above. For Account Name enter the name from which you registered like your email id. For From Phone Number enter that number which got when you created account on Twilio. After that save your custom setting. Hope everything works just fine. I already have the Github code, where can I enter it? I am getting "Phone number is not valid" issue . Can you please tell me what is the issue . I am entering proper mobile number with +91 code .Please help!!! Please send the issue on force.com community and send me the link I will help you brief there, above code works if you go steps mentioned above. I figured out the problem , Thanks for the response . Abhi , instead of json , can we send the data through xml? I am getting this issue. Could you help me for this? This Issue has been resolved but i am unable to get message on my Phone number. Twillio work for only few message to send on a particular number if you using free account. Which type of account you are using ? Yes i am sending Message to the Number which is Verified from Twilio because In case of Trail Account we can only use one number that is verified from Twilio as you said But still Unable to get message on that number. Please recheck your code, that everything is working fine, and your not getting any exception, are getting response from twillio ? I already checked it there is no Exception. If you want I can show you Response Which I got. 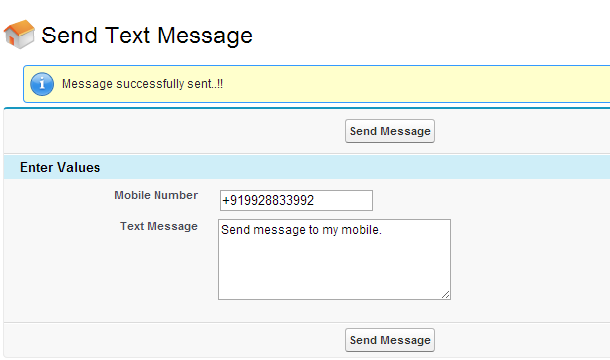 This Issue has been Resolved Now I am able to Receive Message on Provided Mobile Number. Actually there was Some Mobile Network Issue . I Talked with Twilio Support and They Solved This Issue. Still I have one Question Regarding This Integration. Are you looking for Best Cloud Computing training in Delhi. DIAC offering best online Salesforce training , CRM training, Salesforce Lightning - Admin developer training. Free Demo Class. Call now 9310096831.